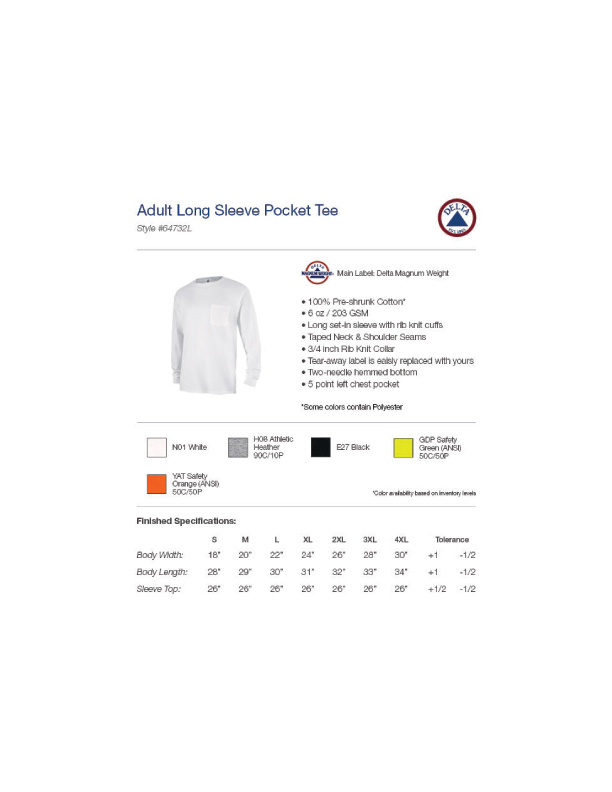 These men's long sleeve pocket t-shirts are fashioned from heavyweight 6-ounce 100% pre-shrunk cotton. While this is undoubtedly the lowest price you will ever find for a long sleeve pocket tee, feast your eyes on the 3/4-inch rib knit collar, tear-away label and rib knit cuffs. You may be downright stunned to learn that there is more to America's favorite shirt. Yes indeed, as durability matters. The bottom has been double-needle stitched & both neck & shoulder seams are taped for added sturdiness. Of the five colors offered, high visibility safety orange & safety green are available. Sizes range from small to big men's plus 4xl. Bulk Pricing.